The NJOY Daily was launched in September 2015 as a follow-up to the very successful NJOY King. The product is claimed to be 90% as satisfying as a combustible cigarette during the first seven minutes. The design of the NJOY Daily represents a move away from traditional cigarettes. Whereas its predecessor (the aforementioned NJOY King) was designed to look exactly like a cigarette, the NJOY Daily E-Cig has maintained all the important qualities, ie soft filter and the mouth end, small and portable feel and great, authentic taste, the color and LED light have changed to reflect changing perceptions of the disposable e-cigarette. 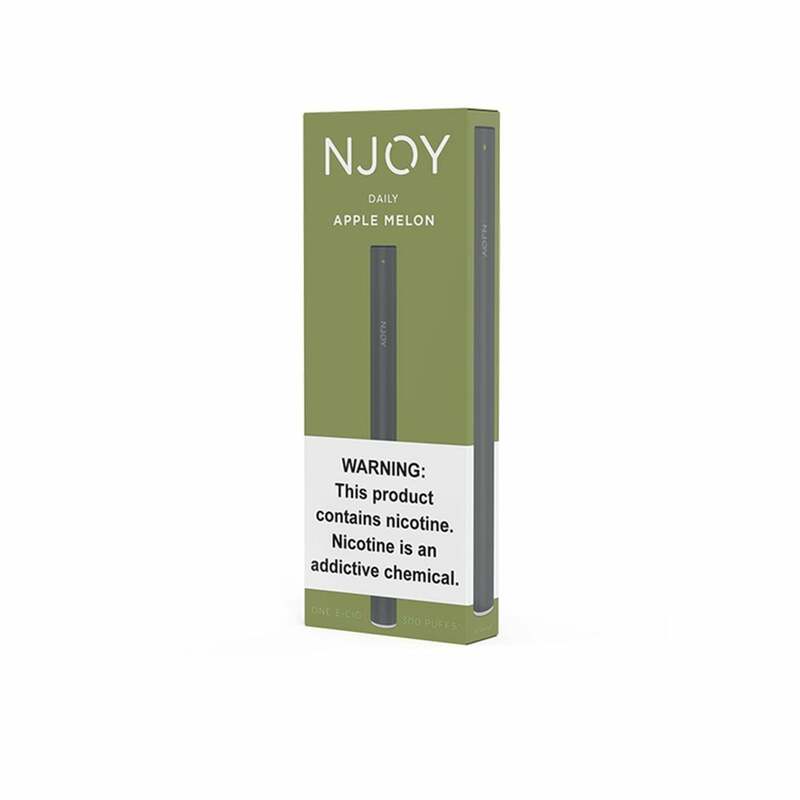 The new Apple Melon flavor by NJOY is the perfect mix of summer and fall vape flavors. A sweet summer melon taste mixes with crisp apple flavors for a fruit flavored vape that delivers the same great throat hit as the other Daily flavors. Apple Melon offers a sweeter alternative to the classic tobacco without sacrificing any nicotine hit. Enjoy the taste of apple and melon now available in a convenient disposable e-cigarette. If you're a fan of the fruity NJOY Blue + Blackberry, try NJOY Apple Melon. This is a great flavor and it’s good quality. It lasts me several days. I really like this flavor, and it is by far my favorite. The product lasts awhile, which is great. The only con is that sometimes you get some that do not work, and that really adds up financially over time. Little more sweeter than others, but if you like green apples, this is for you for sure, it is just like biting into a green apple. I like it in mornings. The Njoy daily Apple Melon is delightfully delicious and convenient. My all time fave disposable! The Daily Apple Melon is one of my favorites. It reminds me of those apple candy's I used to eat as a kid. This is one of my favorite flavors and this is also my favorite brand of e-cigs. Flavor is a little weak but it tastes wonderful. not the smell and taste i was expecting but still a good one.